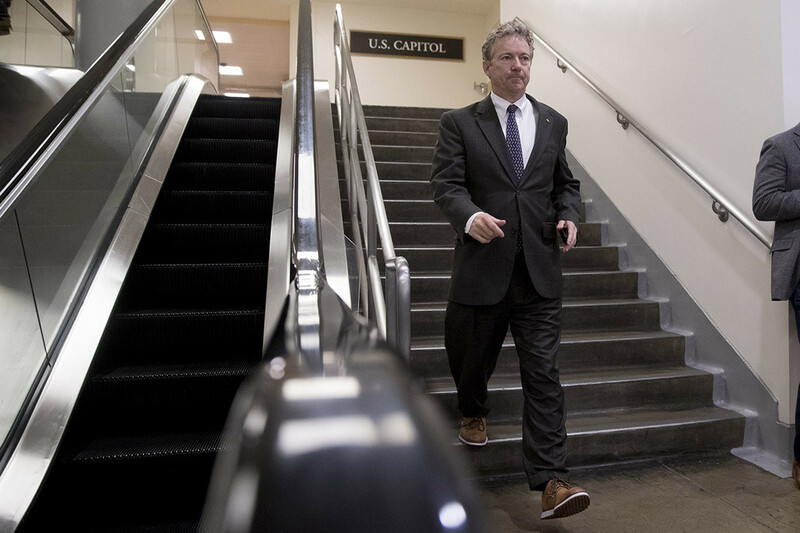 Sen. Rand Paul on Wednesday warned the Trump administration not to go to war with Iran, at least not without getting permission from Congress. The libertarian-leaning Kentucky Republican spoke directly to Secretary of State Mike Pompeo during a hearing of the Senate Foreign Relations Committee. He asked Pompeo if the 2001 Authorization for Use of Military Force, which allowed for U.S. troops to fight entities responsible for the 9/11 attacks and associated forces, included Iran. Pompeo declined to directly answer the question, saying he’d defer to lawyers, but stated that there is “no doubt there’s a connection” between the Iranian government and al-Qaeda, the terrorist group behind the 2001 attacks. Pompeo was testifying before the Republican-controlled committee, a session that came the same week President Donald Trump designated Iran’s Islamic Revolutionary Guard Corps a terrorist organization, prompting concerns about future clashes between the U.S. and Iranian-backed forces. The hearing was supposed to focus on the Trump administration’s proposal to slash the State Department budget by about a fourth. But lawmakers from both parties have dismissed the Trump administration’s budget proposal, saying it was a non-starter the way past such Trump plans have been. Instead they zoomed in on other subjects, from the administration’s strategy in Afghanistan to its struggles to convince North Korea to give up its nuclear weapons. Pressed by Sen. Ben Cardin of Maryland on whether the North Koreans have taken meaningful steps to share details of their nuclear program, Pompeo instead tried to switch the topic to Iran, alleging that what the Iranians had shared as part of the Iran nuclear deal was “a total fraud.” The Trump administration has pulled out of that nuclear deal. Cardin noted he was talking about North Korea, not Iran, then asked if international inspectors were on the ground in North Korea examining its nuclear program, the way they were in Iran. Pompeo said they were not. Senators on both sides of the aisle expressed concern about China’s rising global influence and the potential harm it could cause to U.S. interests. Pompeo agreed with their assessments of the threat and insisted that the Trump administration is keen on countering China’s activities in cyberspace and beyond. One especially testy moment came when Sen. Jeanne Shaheen, a Democrat from New Hampshire who is the only woman on the committee, pressed Pompeo on whether the U.S. would insist that Afghan women be given a significant role in ongoing peace talks with the Taliban. Pompeo wouldn’t commit to such action, but he stressed that the welfare of Afghan women was a priority, especially given the Taliban’s brutal treatment of women when they ran Afghanistan. Shaheen appeared frustrated with Pompeo’s answer. “This is half the population of the country,” she said. “I hope they will make their voices heard,” he said. The secretary of state was similarly unwilling to be pinned down on another sensitive subject: the Israeli-Palestinian crisis. On Tuesday, he refused to tell a Senate appropriations subcommittee whether the U.S. would or would not support Israel if it decided to annex the West Bank, a territory claimed by Palestinians for a future state. He refused to answer similar questions Wednesday, and, as in the past, would not say if the U.S. is still sticking to its longtime support for a two-state solution to solve the decades-old conflict. Pompeo’s appearance came as exit polls appeared to show that hardline Israeli Prime Minister Benjamin Netanyahu’s party had won Israeli elections held Tuesday. Netanyahu raised the idea of a West Bank annexation just before the vote was held, possibly as a way to rally his base. Pompeo noted that the Trump administration is working on a peace plan for the Israelis and Palestinians, and though he would not give details, he criticized past ideas aimed at resolving the crisis as old, tired and ineffective. Those past ideas included having two states for the two people, he noted. “The old set of ideas are not worth re-treading,” he said. Pompeo’s appearance also came amid a shake-up in the administration that has seen the ouster of several top officials at the Department of Homeland Security, a department that frequently works with State on issues such as immigration. Pompeo, a close confidant of Trump whose own position appears safe, echoed the president’s insistence that the rise in the number of migrants from Latin America trying to reach the U.S. has resulted in a crisis along the border.